Rotarians David Bentley, Mike Yarram, Tony Shearer, Peter Elkington and David Hart at last year's beer festival. Make sure you get your orders in as members of the Rotary Club of Sleaford Kesteven hold their 14th annual St George’s Beer Festival. This will be the club’s fifth to be held at the St Denys Church Rooms, just off the Market Place in Sleaford. It will be held from Thursday evening, April 19, 6-11pm, all day Friday and Saturday, 11am-11pm, and lunchtime Sunday, 11am-1.30pm. Tony Dixon from the club said: “We will have some musical entertainment on Saturday evening. There will be a range of 20 beers, ciders and lager with the vast majority of the beers being brewed in Lincolnshire and supplied by Poachers Brewery of North Hykeham. 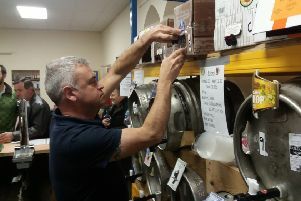 Mr Dixon explained that the event is the club’s main fundraiser for the year with over £8,000 raised last year thanks to very generous local sponsorships of the kegs of beer. The majority of the proceeds will be given to local charities, which have included Rainbow Stars and Hope For Tomorrow in the past and other Rotary charities across the world. Always a very popular event, the Thursday evening will primarily be a sponsors evening, but it is also open to the general public. The Sunday lunchtime slot will be used to ‘finish up’ and it is expected that the full range of beers and ciders will not be available as once the barrel is gone – it’s gone! Other local charities that have benefited from the weekend in the past include: Lincolnshire Emergency Medical Response (LEMR), SSAFA (Soldiers, Sailors, Airmen and Families Association, North Hykeham ‘Sailability’ – sailing for the disabled. There is regular sponsorship of a disabled person’s place at ‘The Calvert Trust’, an outward bound respite centre in the Lake District for disabled young people, plus ongoing maintenance of St Denys’ Church Hall, including a new cooker installed in 2016. Local youth projects have also been supported.